URGENT UPDATE! 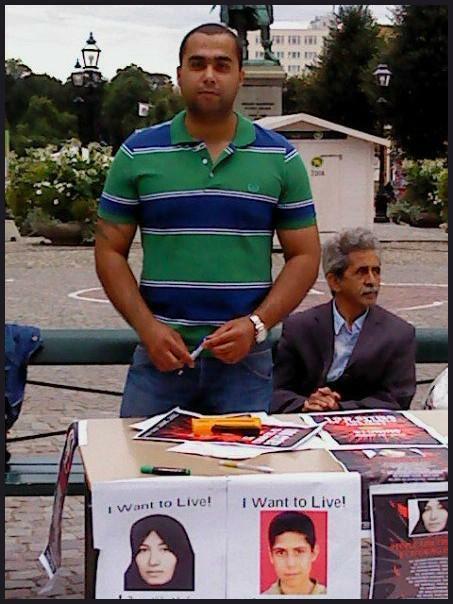 URGENT: Mehdi’s Appeal to Stop Deportation to Iran Denied by Sweden! Wednesday, April 6, 2011: News has just reached us that Mehdi Maleki is on dry hunger strike after the government of Sweden has illegally denied his application for asylum for the second time; they can deport him at any moment. Mehdi’s story appears below. We all know what will happen to him if he is returned to the Islamic Republic of Iran. Sweden’s actions are illegal under international law, and they are sending this man to certain detention and torture if not execution. Please help to stop the Swedish government from sending this young man to detention, torture, and probable execution by the Islamic Republic of Iran. 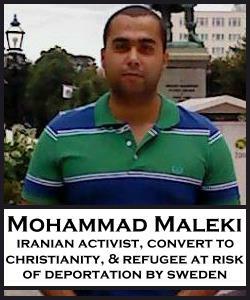 This is the story of Mohammad Mehdi Maleki, a rights activist on the verge of being illegally deported to Iran by the Swedish government, where he will with certainty be detained, tortured, and possibly executed because he opposes the inhumanity of the Islamic Republic dictatorship; he is also a convert to Christianity, which is punishable by death in Iran. Below Mohammad’s story, there is a letter-writing action, with sample letter and email addresses – we urge everyone to participate. Iranian refugees sent back to the Islamic Republic today become political prisoners tomorrow. Mohammad Mehdi Maleki started his activism when he was a student in Iran. Like many Iranian activists, he used the Internet to fight against the dictatorship of the Islamic regime. Eventually, after several years of activism, Mohammad was identified by the regime and put in prison where he spent the next few months under torture. He left Iran when he was released on heavy bail after much effort by his family. After arriving in Sweden and filing for political asylum, Mohammad did not stop his fight against the Islamic Republic; as an activist, he took part in the international campaign to save the life of Sakineh Mohammadi Ashtiani, and participated in several demonstrations against the brutality of the Islamic regime where he chanted anti-regime slogans. 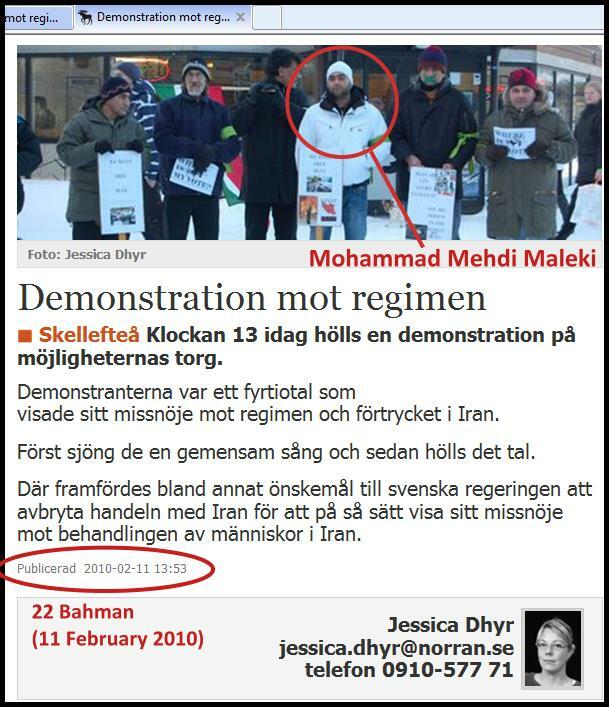 On March 29th, 2011, Mohammad took part in a rally in Örebro to protest the massacre of inmates in Ghezel Hesar Prison and to condemn the treatment and deportation of Iranian and Iraqi asylum seekers by Iraqi, Swedish and Norwegian governments. Along with his anti-regime activities, like many other Iranians, Mohammad has converted to Christianity. In spite of all the above mentioned reasons, and without taking into consideration the consequences of their decision in light of the current political situation in Iran, and the dangers such a decision poses for Mohammad and other asylum seekers, the Swedish immigration authorities have rejected Mohammad’s application. Mohammad Mehdi Maleki participates in an anti-Islamic Republic demonstration on 11 February 2010, 22 Bahman in the Persian calendar, which is a politically-significant protest date as it marks the anniversary of the overthrow of the monarchy in Iran in 1979, and it is the date that the Islamic Republic regime claims to have won the revolution. Considering Mohammad’s past and present political history, which will result in grave consequences should he be deported to Iran, we urge all Iranians residing in Sweden or other countries as well as all [individuals and] organizations defending human rights, and in particular the UNHCR, to take the necessary steps to stop the deportation of Mohammad Mehdi Maleki. Please send the below sample letter to the Swedish Migration Authorities, as well as to UNCHR-Sweden and the International Organization for Migration (IOM). I am writing to you out of great concern for an asylum-seeker you have arrested with the intent of deporting, Mohammad Mehdi Maleki. Mr. Maleki is a known political rights activist and opponent of the Islamic Republic of Iran. He was imprisoned and tortured by the Islamic Republic because of his political views and activism. Once his family finally managed to arranged his release on bail from political imprisonment, Mr. Maleki fled Iran and applied for asylum in Sweden. Once in Sweden, Mr. Maleki continued to participate in protests against the Islamic Republic; he was regularly present at demonstrations against the stoning of Sakineh Ashtiani in 2010, and more recently, he protested against the execution of prisoners in Iran, and illegal refoulements of Iranian refugees. All of these demonstrations have been fully documented and published online; there is no question whatsoever that should Mr. Maleki be illegally refouled to Iran, he will be immediately imprisoned and tortured if not worse on that basis alone. Furthermore, Mr. Maleki has converted from Islam to Christianity. Under the Islamic Republic’s regime, this is called “apostasy” and it carries a sentence of death. The Islamic Republic is actively pursuing a well-documented campaign of persecution against Christians in Iran, including beatings, imprisonment, indefinite detention, and imposition of the death sentence against Christians. We do not have to look far to find an example of what happens to Iranian asylum seekers who are illegally refouled to Iran. On February 9, 2011, the Norwegian government sent 19-year-old Rahim Rostami, an Iranian political asylum-seeker, back to Iran. By March 23, 2011, the news reached the international community that the Islamic Republic had immediately arrested teen-aged Rahimi and is detaining him in Evin Prison. The Islamic Republic has clearly stated its intention to prosecute anyone who leaves Iran and propagates against the regime, and it is making good on its promises. The European Court of Human Rights has already censured the Swedish government for its illegal attempts to refoule refugees to their home countries where their lives are threatened. The Swedish government must immediately cease its inhuman violations of the rights of asylum-seekers. We demand that Mr. Maleki’s deportation order be immediately canceled, his case reviewed, and if necessary, that he be supplied with competent legal representation. He clearly meets the criteria for obtaining refugee status; anything otherwise is illegal under international law. محمد مهدی ملکی از سالها پیش در ایران یک دانشجو معترض به نظام دیکتاتوری ایران بود . محمد هم جز فعالینی بود که از طریق اینترنت بر علیه رژیم دیکتاتوری اسلامی فعّالیت میکرد. محمد پس از سالها فعالیت، نهایتاً شناسایی شد و مورد پیگرد دستگاه قضای رژیم قرار گرفت. محمد دستگیر شد و برای مدت چند ماهی‌ زندانی شده ، و تحت فشار و شکنجه قرار گرفت. محمد به کوشش خانواده، و به قید ضمانت سنگین از زندان خارج شد و با استفاده از این فرصت از کشور و به منظور رهایی از خطر دستگیری مجدد خارج شد……. محمد مهدی ملکی‌، پس از ورود به سوئد و درخواست پناهندگی از این کشور دست از مبارزه بر علیه رژیم جمهوری اسلامی نکشید، بلکه بر عکس با شدت به فعالیت خود برای ایرانی آزاد و آباد ادامه داده است. محمد جز فعالینی بود که در ارتباط با کمپین دفاع از حقٔ زندگی‌ سکینه محمدی آشتیانی بارها به خیابان آمده و بر علیه وحشیگری رژیم اسلامی و ضرورت سرنگونی آن شعار داده و در تظاهرات های متعدد شرکت داشته است. آخرین تظاهراتی که محمد مهدی در آن شرکت داشت تظاهرات ۲۹ مارس در اربرو در اعتراض به قتل عام زندانیان قزلحصار، در محکومیت سیاست ضدّ انسانی‌ حکومت محلی کردستان عراق در تبعید غیر قانوننی پناهجویان ایرانی، در محکومیت دیپورت غیر قانونی پناهجویان ایرانی توسط دولت نروژ، و بر علیه سیاسات‌های قی‌ اخلاقی‌ دولت سوئد در قبال پناجویان و بخصوص موج اخیر اخراج پناهجویان عراقی از سوئد بود..
در کنار تمام این فعالیتهای ضدّ رژیمی، محمد مهدی نیز مانند بسیاری دیگر از ایرانیان که در اعتراض به وحشیگری رژیم اسلامی ، از دین اسلام خارج میشوند، به مسیحیت گرویده است..
علیرغم تمام موارد فوق، اداره مهاجرت سوئد بدون توجه به ادله و اسناد و عواقب تصمیم غیر منطقی‌ خود، بدون توجه به شرایط سیاسی ایران، و خطراتی که محمد و یا هر پناهجوی دیگری را تهدید می‌کند با درخواست محمد مخالفت کرده محمد مهدی ملکی‌ دیشب از سوی پلی دستگیر و به کمپ بسته فلن در حوالی کاترین هولم منتقل گردید. DEPORT IN PANAHJO KAMELAN GHEYRE GHANONI VA DOR AZ ENSANIYAT AST. We demand to stop deportation of Mohammad Mehdi Maleki because all of us know what kind of destiny waiting for him in Iran. If you still want to this illogical deportation you must be accountable for the consequences. The Swedish government knows very well what would await Mohammad if he was forced back to Iran and yet they want to send him back. Rahim Rostami is an excellent example of what happens to those Iranian dissidents who are deported. Please stop this deportation now. Playing with the life of asylum seekers as a political game is not acceptable. Sweden government should remember that when Iran regime collapse they have no justification for their irresponsible act of deportation of an individual who is going to be executed. Please be wise and be freind with Iran nation, now it is time. stop deportation from mohamd mehdi maleki , if he is deported the Eslamic regime of Iran certainly will arrest him and execution is waiting for him . Refoulment is a criminal act. Stop this illegal deportation now! I have been sent an email on facebook that, Mehdi is in jail already in Iran. I have stayed for some years in both sweden and Norway in an assylum related setting. These two countries need lessons in non-violence actions. Assylum seekers spent lots of years in Lier camp in Norway rotting under a watchful eye of the Norwegian government, people despaired and faced dark truths about life. We are very concerned and distressed about the continued detention and isolation of our colleagues. We remain as a democratic opposition whether in Iran, Norway, Sweden or China. I will appeal to the populations of Europe to embark on the modern democratic change of things i.e The mode of struggle substituted the notion of armed struggle with that of popular struggle. It stopped thinking of struggle as something waged by professional fighters, guerrillas, with the people cheering from the stands, but as a movement with ordinary people as its key participants. The potential of popular struggle lay in sheer numbers, guided by a new imagination and new methods of struggle. The real challenge is to forge possibilities for a new politics, on the basis of new associations and new imaginations. The real challenge is not revolution but reform. The verdict is still out whether it is government or locals that will take the lead and provide the initiative for the pright of the likes of Mehdi. Thank you for your comments and concern for Mehdi, among other asylum-seekers. Mehdi is still in detention in Sweden, and we continue to work for his release, and to secure his asylum in Sweden. You may be thinking of Rahim Rostami, a 19-year-old Iranian boy who was illegally refouled to Iran by Norway and who was immediately imprisoned by the Islamic Republic. I appreciate your idea of popular struggle to create societies worthy of the name “human.” And I think the well-being of asylum-seekers will be a leading indicator of our success in achieving that better future so many of us envision. Mellan 1851 och 1930 emigrerade ungefär 1,5 miljoner svenskar till USA.